Objective: To build a car which runs a 100Km race using a combination of solar power and limited battery storage. Overview: This car already existed when I joined the team. although it was in very bad shape. Over the next few years we worked to rebuild the car to a competition level vehicle. As project manager for the last few years of the car’s life, I oversaw the rebuilding of the car every year and made decisions as to improvements. During this project I was heavily involved in the Aero shell design and fabrication.. 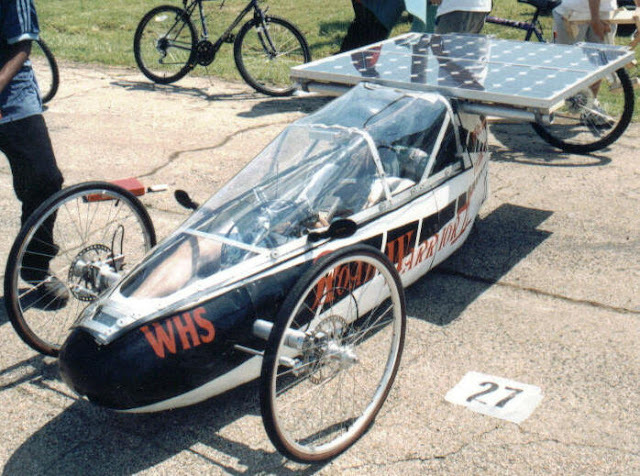 Results: The vehicle last raced in spring of 2001 and was ranked 7th in it’s class for the nation. This improved the rankings from the previous years where the team was ranked in the top 20. Current status: In the fall of 2001 the team changed focus to Robotics, at which point the car was retired. There was an effort in 2004 to rebuild the car for display purposes, but those plans never were completed. Currently the car is still functional in a storage facility in Maryland.